Releasing their album Dealer in 2015, St. Louis rock band Foxing became a group to watch, while tackling such topics as the Catholic Church and losing one’s virginity. Now the group is back with a brand new record titled Nearer My God out on Triple Crown Records. Coming in at just under an hour, the group pushes themselves further than they have on previous albums, giving fans a taste of a musical style that you can’t pin down. Opening with “Grand Paradise,” the track’s noisy flavor is a great introduction to the St. Louis four-pieces’ new batch of tunes. 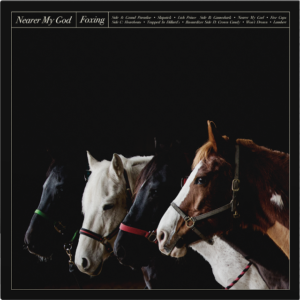 Bringing together great vocals and flawless musicianship, Foxing won’t be for everyone, but for longtime fans and new listeners, Nearer My God may just be their favorite record to date as the group continues to discuss topics with lyrics that fans will have fun analyzing, while giving them a musical backdrop that pairs well with each song lyrically. Cuts like “Gameshark,” is one of the LP’s standout tracks, and one where the band really dives in creatively, particularly with how the tune is written, as front man Conor Murphy has recorded the song singing in other languages including Japanese, French, Spanish, and German, something he says was hard to do, but nonetheless a fun experiment. After “Gameshark,” we hear “Bastardizer,” a rock song that brings warmer influences on Nearer My God, changing the record’s sound and pushing the envelope creatively so that the band can fully challenge themselves. Murphy sounds great on this track, bringing his songwriting abilities to the forefront. Closing with the song “Lambert,” Foxing probably won’t become the biggest group in the world, but for the indie fans who are already familiar with the band, Foxing will remain a secret that they don’t want to get out.